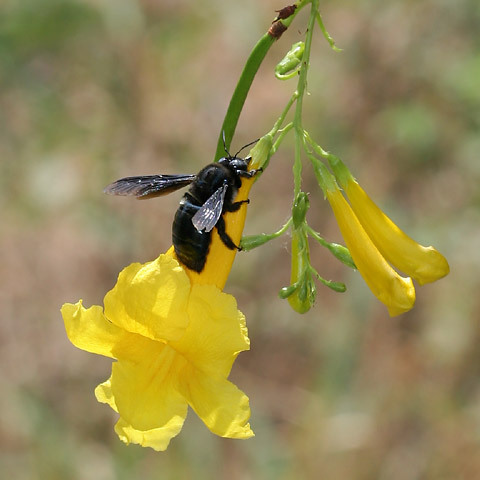 Carpenter bees (Xylocopa spp.) are large, solitary, wood-boring bees. Because these bumblebee-sized bees are often too large to fit inside tubular flowers, they will "cheat" and instead chew a hole into the base of the flowers to reach the nectar inside. This carpenter bee is chewing a hole into one of their favorite flowers here in Tucson, that of a Yellow Trumpetbush (Tecoma stans). 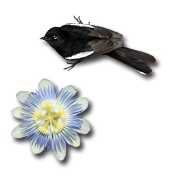 The black females will excavate tunnels in wood to be used as nests for their young. Each chamber in the tunnel is first provisioned with a ball of pollen and regurgitated nectar, and after the female lays an egg in each chamber, she will loosely seal the chamber with plug of chewed wood pulp. 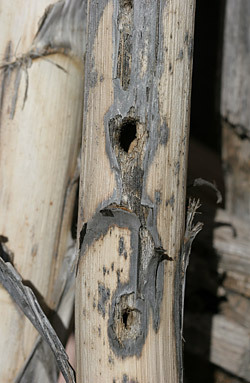 Not all carpenter bees are destructive to the wood around your home because some females prefer to excavate their nests in the dead, dry stalks of Agave (Agave spp.) flowers. 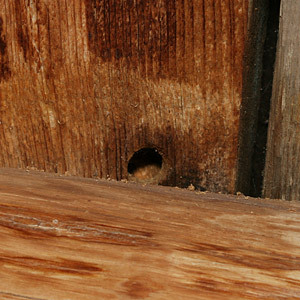 Unfortunately, other carpenter bees are wood pests and will bore holes into unpainted exterior wood. This carpenter bee hole is in the wood under my back porch. My dogs were surprisingly upset by the large carpenter bee busily buzzing around under the back porch, and every time it showed up, my dogs would begin barking angrily at it and making wild leaps into the air to snap at it in an attempt to capture or kill it. Thankfully, they never caught it because female carpenter bees have painful stings. Now if I say "buzzy bee" to them, my dogs will angrily race to the back porch with their hackles raised, ready to do battle with that evil carpenter bee.